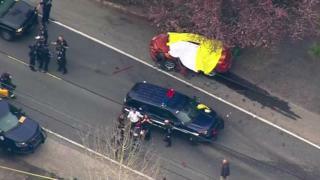 Two people were killed and two more critically injured when a gunman opened fire in the US city of Seattle, before causing a fatal crash in a stolen car. The gunman first shot and injured a woman motorist at a junction, before walking into the street and opening fire at a bus, wounding the driver. He then killed a man and stole the man's car, speeding off and driving into another car, killing the driver. The suspect was arrested but his motive was not immediately clear. At a news conference, Deputy Police Chief Marc Garth Green called the shootings a "random, senseless act", the Seattle Times reported. Transport officials said that the bus driver activated an emergency alarm after he was shot in the torso and managed to turn the bus around and drive away. None of his 12 passengers was injured. The driver, named by local media as Eric Stark, 53, was able to walk from the vehicle and was taken to hospital, the officials said. The victims, a 70-year-old man and 50-year-old man, have not been named by police. Police said the incident took place in the north of the city, and the suspect, 33, was arrested after a crash near Sand Point Way Northeast. He was taken to hospital and treated for injuries that were not life-threatening, police said. Seattle Mayor Jenny Durkan called Mr Stark a hero after the incident. "We are pulling for those injured and know this is a real test of us a community," Ms Durkan said. "We will continue to come together to heal."